I do love the great backgrounds in our Gorgeous Grunge stamp set. Here a splattering of Gold Encore ink on the Basic Black card stock was a great 'frame' to the focal point. Stamping this FREE Stamp Set Simply Wonderful (a must have and available for a LIMITED TIME) on Very Vanilla card stock 2"x3". Accent with a 1-1/2" x 3" piece of Gold Glimmer Paper for a jazzy sparkle. This 4" square card is a unique size and shape - sure to stand out above other cards (not that it is a competition or anything - lol). This card was inspired by the CEO of Stampin' Up! 's blog. I took this fab look and did a variation. 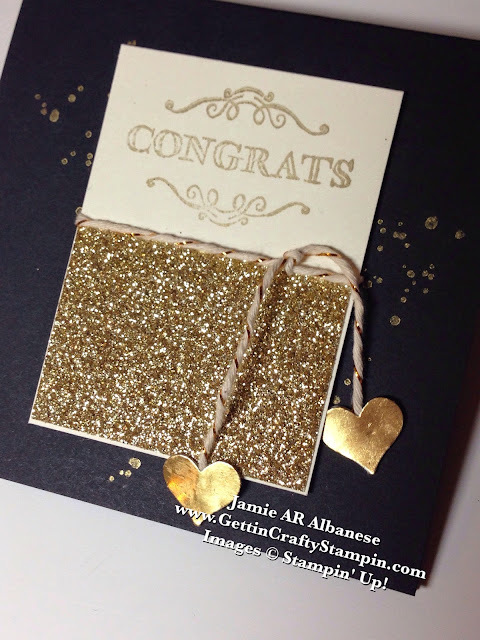 It was a Class Favorite at our recent Gold card making event. I love these hanging hearts!! Using the heart punch from the Itty Bitty Accents Punch Pack and punch four hearts. Tie the Gold Baker's Twine (see this video below on how to prevent it from un-raveling!!) around the stamped card stock. Using Glue Dots to apply the Gold Foil punched hearts back to back for a cute hanging accent that will move and shine. 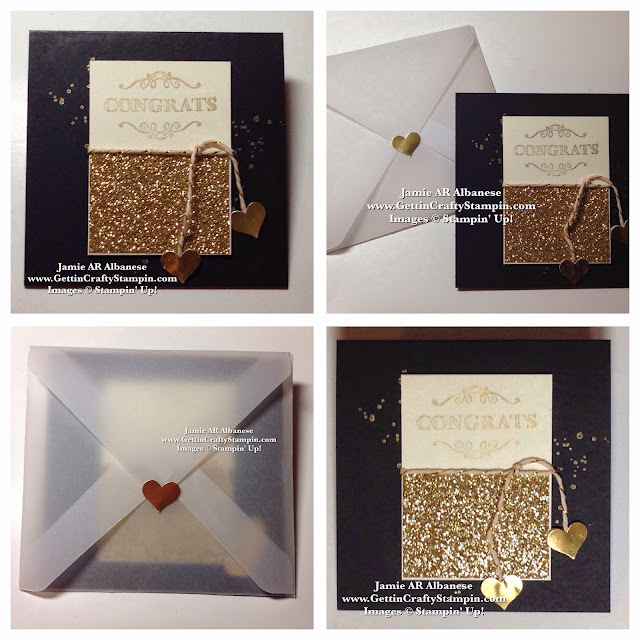 Using one of our COOLEST Tools - the Envelope Punch Board and White Vellum card stock to create a sheer and fancy (but oh-so-easy) custom envelope! With three weddings THIS YEAR (my oldest daughter, cousin's daughter who is like my niece and my niece - whew!!) this card sure fits the bill in celebrating their upcoming nuptials! The Vellum Envelope fits the unusual size of this 4" square hand-stamped card and gives an elegant peek at the contents! 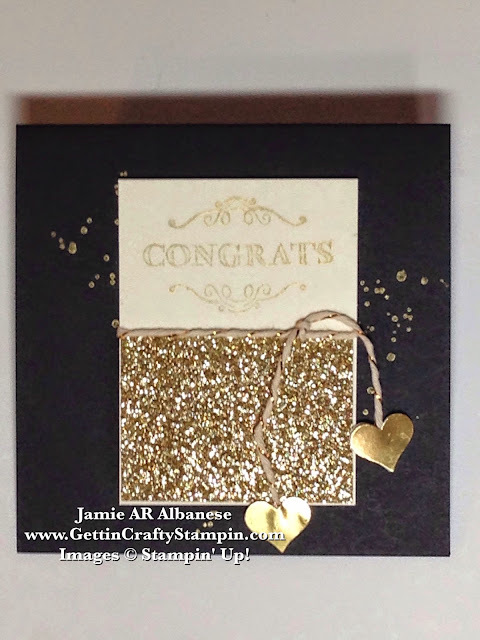 Celebrate life with others with this hand-stamped sparkle and shine gold congrats card! 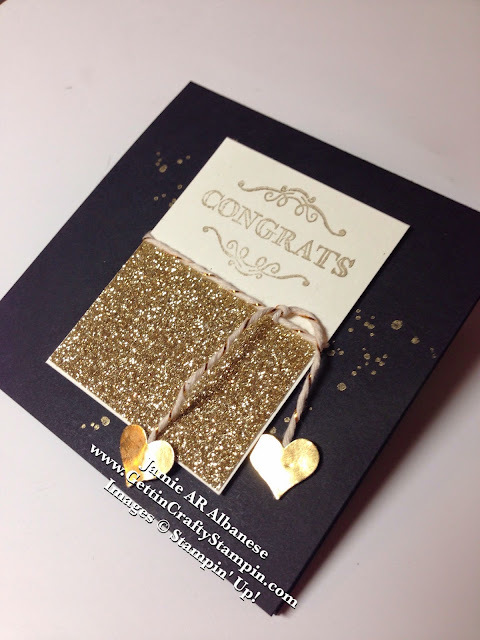 With many layers of gold - this card has dimension and style - sure to brighten someone's day/celebration. Sending a WOW hand-crafted card is sweeter knowing that the Congrats was FREE (I love FREE - don't you??). Join me in sending a small measure of love that will bless greatly.